Exciting things are happening at New Hope. We would love for you to join us in worship and Bible study on Sunday morning and evening. Contact us with special prayer or ministry needs. 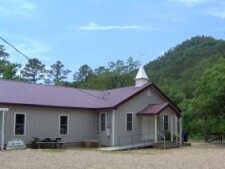 We are located East of Mena, Arkansas on Highway 375 E.
Directions to our church: From Mena, AR, take HWY 8 East, 1.3 miles on Hwy 375 E. Travel 11.7 miles, continue on Polk 64 to Shady Lane. Church is on your right.